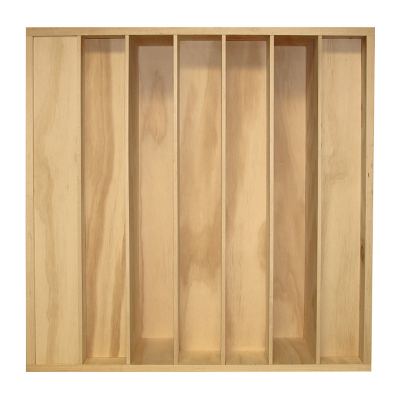 The ATS Acoustic Diffuser is a precisely calculated Quadratic Residue Diffuser (QRD) designed to evenly scatter sound energy and help eliminate comb filtering and flutter echo. Absorption panels can control these problems as well, but can sometimes cause dead sound if too much absorption is used in the small room. Diffusion on the other hand, adds a sense of spaciousness and retains the room’s natural ambiance. Diffusers are most commonly used on the rear wall behind the listening position, but they can also be used at first reflection points on the walls or ceiling. At ATS Acoustics, our diffusers come with a professional installation kit that is included at no extra charge. This installation kit includes aluminum clips, screws, and anchors for neat and secure installation on drywall, concrete, or wood walls. Diffusion is a popular, effective solution used in professional recording studios, listening rooms, and large auditoriums. ATS Acoustics offers diffusers in two different sizes to help fit in any space: 23”x23”x6.5” or 23”x48”x6.5”. The small square version is ideal for stacking, fitting into small spaces, and transporting with ease. Actual Dimensions: 23-1/16″ x 47-5/8″ x 6-5/8″. Weight: 40 pounds.